Updated from the archives. Originally posted August 2014. Something about having little ones at home makes me so happy to re-live my childhood favorites with my kids. Watching old movies I loved, reading favorite books, and sharing favorite treats with Milo and Sophie for the first time is even better than my getting to experience it for the first time. Watching our kids toast marshmallows for the first time was totally one of those things for me. Their wonder at watching the white marshmallow slowly brown, and their glee of swishing around an entirely too-large stick… it’s all so much fun. Now that their big enough to appreciate it, I’ve also been trying to remake a lot of kids’ classics (gluten free, dairy free style) so they don’t have to miss out on any of those fun things you get to enjoy as a kid. 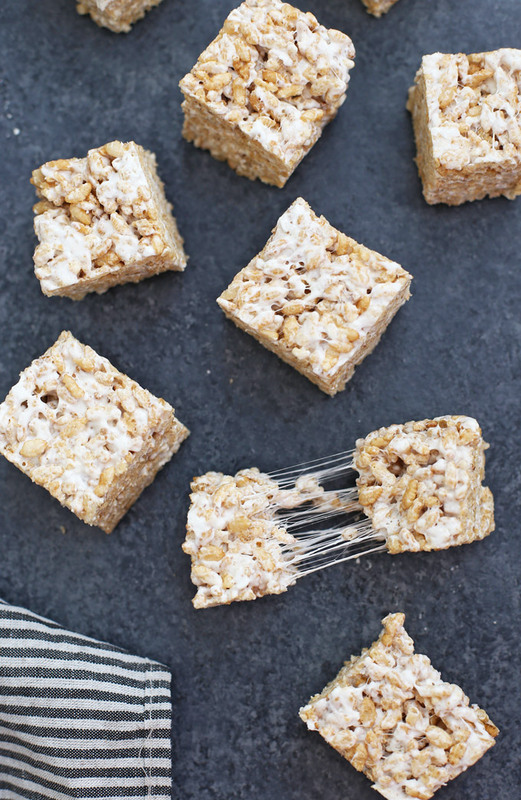 These toasted marshmallow rice krispies treats are a perfect example. 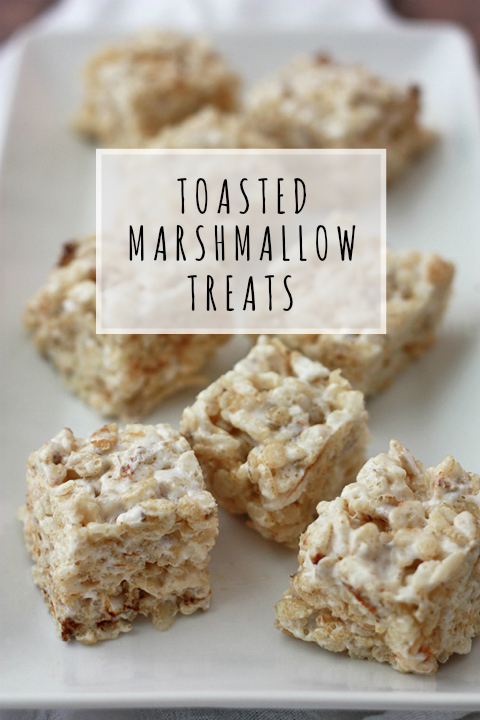 We took the best parts of roasted marshmallows and combined them with rice krispies treats. The end result is THE BEST crisp rice treat I’ve ever EVER had. 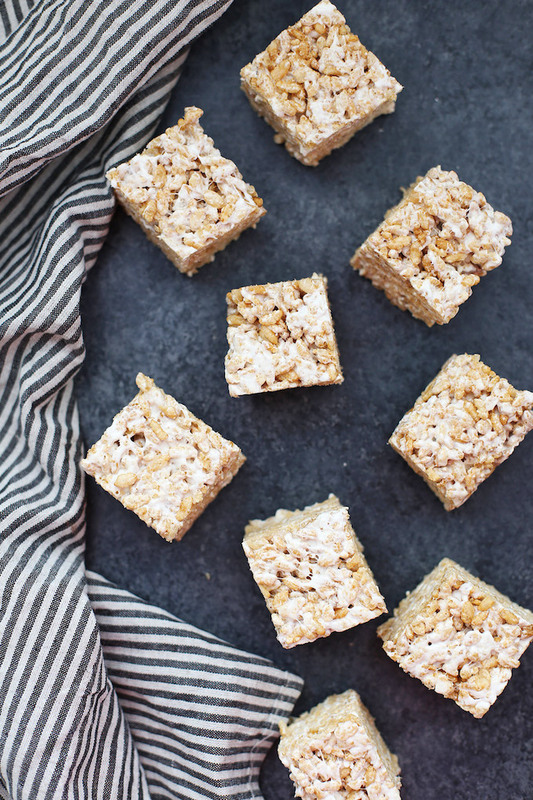 Four ingredients, one easy technique, and a simply delicious treat. 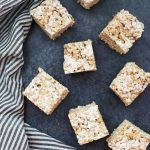 It doesn’t get much simpler than Rice Krispies treats, I know, but toasting the marshmallows and using coconut oil in place of the traditional butter really adds so much to the flavor! Magically, I don’t think these taste coconut-y. 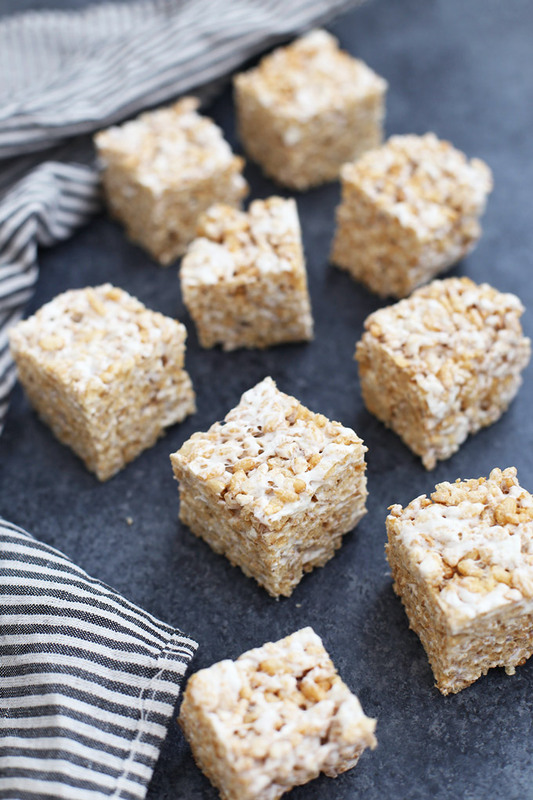 Instead, the toasty, caramelized marshmallow bits and a teensy pinch of sea salt come through to make a craveable, shareable treat we can’t get enough of. I will warn you that they are HIGHLY addictive. Give them away or send them in lunches. …ooooor eat them by yourself in the pantry when no one is paying attention. No judging here, friends. Work quickly and be prepared. These need to be assembled quickly, so don’t dawdle after pulling the marshmallows out of the oven. Have everything measured and ready BEFORE you put the marshmallows into the oven. The marshmallows toast REALLY quickly, so you need to watch them carefully. They’ll be done in 30 seconds to a minute or so. Really, truly. Gluten Free? No problem. Make sure you buy certified gluten free crisp rice. We like Barbara’s crisp brown rice or Erewhon brand. I’ve ordered both from Amazon, but can usually find them for a better price ($3-4 per box) at Sprouts. Vegan? I’ve tried these with Dandies (I’ve found them at Amazon, Sprouts, Whole Foods, World Market, etc.) and Trader Joe’s brand is vegan! They work great! 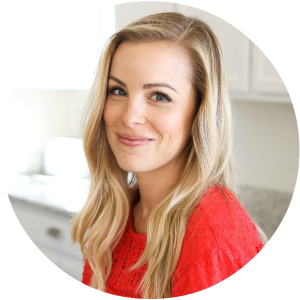 Not into Coconut Oil? You can use butter or vegan butter for these beauties if you prefer. Use the same amounts and just melt or soften the butter beforehand so it blends well into the end mixture. Change it up. I love these straight up the best, but you CAN add a few chocolate chips on top for a s’mores feel, or sprinkle them with a little cinnamon-sugar for a churro effect. PLEASE DON’T HATE ME FOR SHARING THAT WITH YOU. You will never be able to stop eating them. Line an 8×8 or 7×11 baking dish with parchment paper or spray with nonstick spray. Spread marshmallows out across the baking sheet and place under broiler for 1-3 minutes, or until toasted. If desired, try shaking or flipping over the marshmallows and return to the broiler for another 1-2 minutes to toast another side. Immediately place marshmallows in a large bowl with the coconut oil, and stir quickly to melt marshmallows. 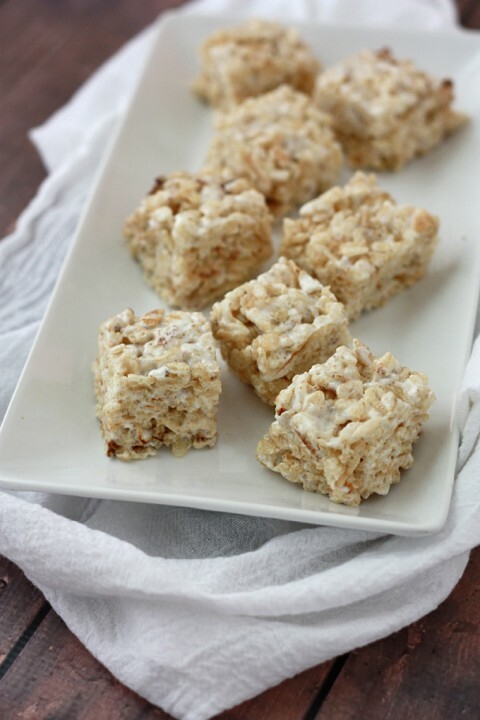 Stir in 5 1/2 cups rice cereal and continue stirring until cereal mixture is well coated with marshmallow mixture. If the mixture is a bit gooey, add the remaining 1/2 cup cereal. Press mixture into baking dish. For thinner treats, you can use a larger pan. Sprinkle with salt. Allow to cool and set, then cut into desired number of pieces. We can usually get 16-20 treats out of this recipe. This is a genius idea. And now I’m at work on my lunch break craving a rice crispy treat. Yummy. 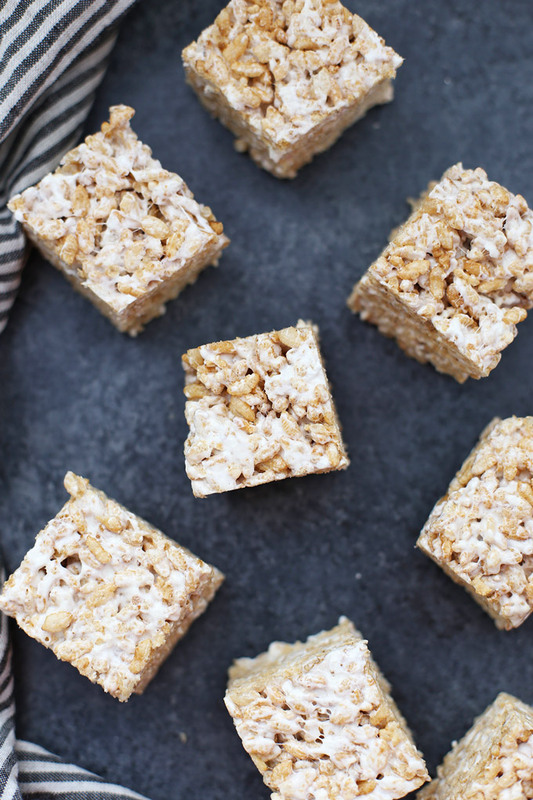 Ok I made these today and holy cow, they are the best rice krispie treats I’ve ever had! Good work woman. We may or may not have made them an embarrassing number of times. They’re the best! Just whipped up a batch of these and WOW!! Your recipe is fantastic! Many thanks! So glad you liked them! We can’t get enough! Made this, but I toasted a layer of mini marshmellows on the top. Looks so good, my family is in for a treat tonight. An extra layer of marshmallows sounds AMAZING!!! Yum! I totally need to be making rice krispies more often! These look yummy! Just made these and they are delicioussss. I also added a dash of vanilla extract, I figured it couldn’t hurt. The coconut flavor really adds depth! Ooh, I bet the vanilla was delicious! I’ll have to try that! I made these and it didn’t mix well. The oil kept the marshmellow from grabbing onto the cereal. It turned into globs of marshmallow with cereal falling off. Oh dear! It sounds like maybe your marshmallows didn’t heat through properly (or maybe they cooled too much before being mixed in). I’m sorry that happened! That’s never happened to me before. Ooh, I bet that was delicious!! !